Blackhawk Bancorp (OTCQX:BHWB)…with a name like that how could you not dig into the company? The bank name reminds me of the movie Black Hawk Down or the Sauk war leader Black Hawk himself. However, the bank has nothing to do with helicopters or Sauk war leaders – even though they do have a picture of planes on their 2015 annual report; which is a whole 16 pages long by the way. Likewise, the bank was founded in 1881 and is headquartered in Beloit, Wisconsin – thus, it’s your typical boring bank. Blackhawk operates eight banking centers – located in Wisconsin and Illinois. The bank is a small lender that specializes in commercial based loans – C&I loans equate to 33% of the loan portfolio, COO equate to 23% of the portfolio and Other Commercial loans equal 14% of the portfolio. The other remaining bulk of the loan portfolio, 23%, is 1-4 Family loans. Timyan’s article was published back in early 2012 – and is one of the only public articles written on Blackhawk. Today the company is trading around $17.60/share, after retreating from a high of around $20/share. At first glance, the company looks attractively priced: P/B of 86% and P/E around 7.41x. However, the P/B doesn’t take into account the $5,037,000 in goodwill and the P/E doesn’t account for the one-time gain associated with a fraud loss recovery. Taking into consideration the former the P/TBV becomes ~96% and the P/E turns into 10.84x – not as attractive as before. On a dividend basis, the company recently increased their quarterly dividend from $0.02/share to $0.04/share – a 100% increase. Despite the attractive increase in the dividend, the company still pays a paltry annualized yield of only 0.91%. This yield isn’t anything to brag about and I don’t think we will see ‘yield hungry’ investors flocking to Blackhawk anytime in the near-term. The company has also seen its interest income continuously fall in the past five years; from $24,822,000 in 2011 to a low of $22,234,000 in 2015 – a -10.43% decline. Despite the precipitous fall in interest income, noninterest expense has continued to increase from $19,551,000 in 2011 to a high of $21,341,000 in 2015 – a 9.16% increase. Sure, interest expenses in the five-year time period has fallen ~54% and net income has grown ~120%. Furthermore, ROE and ROA have hit five year highs of 8.90% and 0.66%, respectively. However, the continuous rise in noninterest expense is alarming and simply put, around twenty-one million a year in noninterest expenses is quite high for a bank with a market cap around forty million. 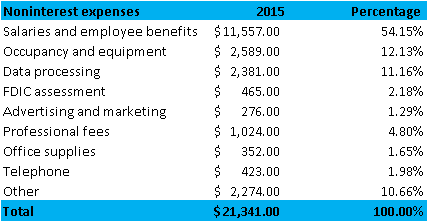 The biggest noninterest expense is salaries and employee benefits, which equate to 54% of noninterest expenses. This is then followed by occupancy and equipment, data processing and other, which equate to 12%, 11% and 10% of noninterest expenses, respectively. It’s quite challenging for a small bank with under one billion in assets to achieve the scale they need to operate efficiently. There are a few things banks can do to offset the increasing regulatory expense environment and the low interest rate situation: scale up, drastically cut unneeded expenses or sell themselves. I don’t think Blackhawk is going to scale up anytime soon via acquisition – based upon the language in their recent annual report. I also am skeptical that noninterest expenses will be cut anytime soon either and will probably incrementally increase – especially on the salary side and from more stringent regulations. One optimal case for producing ‘quick’ shareholder value is selling the bank completely. An acquirer could make a decent gain form cutting noninterest expenses. Based on our model above, an acquirer could come in, cut noninterest expenses 30% and applying a multiple of 10x we get a premium to takeout value of almost 100%. Even in the bear case, if an acquirer only cuts noninterest expenses by 15% and with a multiple of 8.0x there is still a solid 16% gain. The model above doesn’t take into account the interest expense savings from cutting out unneeded FHLB loans and the possibility of taking out the subordinated debentures from a potential acquirer. Taking the former into account, the upside from a potential acquirer becomes more attractive. The key question is; will management perform their fiduciary duty to shareholders and maximize value? I’d think not. First, the CEO and CFO are still ‘younger’ than your typical bank CEO who is looking to sell to maximize value for himself. Secondly, executive officers hold a paltry amount of shares outstanding- meaning they will realize more value for themselves on a going concern basis. Finally, the language in the recent financials speak of organic growth – not the maximization of value via outright sale. Thus, as it appears now, the future of Blackhawk bank is to continue operating with a high-end efficiency ratio of ~77%. It is unlikely the bank will ever command a P/TBV over 1.00x and the stock appears to be appropriately valued by the market. Unless there is a dramatic price drop, management alludes to cutting noninterest expenses or the bank starts looking for a sale, an investment in the company appears to be ill-advised. This entry was posted in Uncategorized on August 24, 2016 by Nick Bodnar. A small community bank located in the rural state of Wyoming. The bank is trading significantly below its TBV. Despite the notable turnaround, an initiation of a dividend and vast bottom line improvements, the market is pricing this company in value territory. Either the valuation gap will close or another bank will step in and take this company over. “There are actually several “legends” or “myths” that explain the name. In these legends, the “crazy” woman is either white or Indian. According to one Indian woman version, a squaw who was left completely alone after her village had been attacked, lost her mind and lived in the area in a dirty, squalid manner until her death. Another story involves a white family named Morgan, traveling by covered wagon, who was attacked by Sioux warriors. They tomahawked and scalped the husband and three children. Mrs. Morgan was not killed but was driven out of her mind from witnessing the terrible fate of her family. However, she had seized an ax and killed four of the attacking Indians who then left her alone. Supposedly, a mountain man named Johnson chanced upon the scene shortly thereafter, buried the dead family members, but could not persuade the woman to leave the gravesides. As a warning to the Indians not to bother her, he decapitated the dean warriors and placed their heads upon stakes near the graves. Johnson then built the woman a small cabin and stopped by occasionally to bring her supplies. Before we go too off topic here is a quick video of the scenic view of Crazy Woman Creek—note the rural aspect of the area. Here is a longer video. Today, the company is a three branch bank with Buffalo Federal Bank as the subsidiary and Crazy Woman Creek as the holding company. The bank was started in 1936 and is headquartered in Buffalo Wyoming. The three locations are in Buffalo, Gillette and Sheridan, Wyoming. CRZY is your typical Post-TARP turnaround. The company took on TARP funding back in 2009 and has recently retired the cumbersome preferred and warrants that came with it. With the retirement of the TARP funding, the company has initiated a common dividend, bought back a slight amount of shares and will experience cash inflows for the FY. Moreover, the TARP redemptions have allowed the company to increase its bottom line by 60% in the first nine months. The company is trading at an attractive price, however, the company is not very liquid. Moreover, many investors will not be able to establish a meaningful position. If you don’t mind liquidity and have a lot of patience, CRZY would make for a great investment in a basket full of community banks. Back in 2013, the company had Classified Assets to Tier 1 Capital at 33.25%; high right. However, this was a vast improvement from 2012 given they were at 57.37% just one year before. The company also experienced a turnaround in their bottom line from a net loss of $38,000 in 2012 to a gain of $366,000. 2014 was a good year for the company. In the previous six quarters, the state of Wyoming was losing jobs, however, at the end of 2014, there was a 1.4% employment growth in the mining sector. Furthermore, loan demand started to catch up to its neighboring states. The company also received regulatory permission to pay off the TARP obligations and they were in the process of finalizing the sale of their Casper Branch. Finally, the cost of funds fell from 0.60% in 2013 to 0.39% in 2014. In 2015 net income improved by 43% and Classified Assets to Tier 1 Capital decreased from 32.35% to a low of 11.40%. The company also had a balance of zero for repossessed assets (in 2012 repossessed assets were $2,487,000) and loan growth was 15.3%, ranking the bank in the top ten for all Wyoming banks. In addition, the company initiated a $0.25/share annual dividend. Finally, the net interest margin hit a high of 4.26%, which is above the Wyoming median of 3.46%. In the first nine months of 2016, total assets decreased from $109,706,000 to $106,022,000. Despite the decrease in total assets, loans increased from $66,410,000 to $69,211,000 and deposits fell to a low $89,439,000. Deposits fell due to the company’s plan of getting rid of high cost CD deposits and replacing them with lower cost deposits. Finally, stockholder equity grew from $11,764,000 to $12,108,000 and diluted EPS grew an astounding 60%. The company is officially in turnaround mode. TARP obligations are gone. A dividend was declared. And the bottom line is rapidly increasing. Given the liquidity nature of the company or lack of liquidity, the company still sitting near attractive valuations. There are a few things to like about CRZY. One of my favorites is that it is grossly undervalued on a P/TBV basis. There are a few reasons for the undervaluation. First, the company is a pink sheet community bank. Secondly, the market cap is under ten million. Thirdly, there isn’t much liquidity. These three reasons will give the bank a basement level valuation, despite the notable turnaround efforts. Despite the liquidity, the absolute low market cap and pink sheet nature of the company, the bank is trading for a significant discount and they continue to improve their bottom line in a dramatic way. The valuation under TBV should not persist forever, especially if they continue to improve operations. Moreover, either the market will give the company a better valuation in the coming quarters/years or another bank will step in and realize the undervaluation themselves. There are not many public banks in Wyoming so I had to compile data from private banks in the area for comps. As shown above, CRZY outperforms their local peers on a NIM and noncurrent loans to loans basis. Other areas such as ROE, ROA, efficiency ratio and total risk-based capital ratios, the bank lacks. However, the absolute low noncurrent loans to loans, low cost of deposits and higher-end efficiency ratio could prove to be beneficial on an acquisition standpoint. Another bank in the area such as First Northern Bank of Wyoming could buyout CRZY, eliminate 35% of noninterest expenses and have immediate accretion to earnings. Finally, the company has recently eliminated their TARP funds. TARP obligations are a huge overhang in regards to M&A and substantially eat into net income. For an example, in 2014 and 2013 the company was paying around $160,000 on their TARP obligations. Now the company can cash flow these earnings and/or pay more in dividends. The elimination of the TARP obligations has also increased net income for the first nine months of 2016 by ~60%. This is a huge increase in the bottom line. The market is officially saying that CRZY is not worth more than TBV and all improvements going forward mean nothing in regards to valuation. The market realizes the discount and value will become its own catalyst. Another company takes over CRZY. Continual improvements in operations and/or a dividend raise. There isn’t much liquidity in the stock and establishing a meaningful position may take some time. Investors should use limit orders and expect their money to be tied away for the long-term. The demographics in Wyoming are not the best right now. The state is heavily tied to the O&G industry and the low price of oil may hurt loan growth. The company has a significant amount of loans in the commercial sector. These loans are typically riskier. Offsetting the risk is the company’s high amount of investable securities in their capitalization structure. Further regulations will increase noninterest expenses making the bank’s efficiency ratio increase. This could be beneficial for they could look to sell themselves to a larger bank if regulations continue to increase. CRZY is a unique micro-cap bank that is flying over the heads of many bank investors. The company is trading at an attractive valuation and is in turnaround mode. It will be hard for investors to establish a position in the bank, however, an investment at the current price could be very compelling. I believe the bank is worth at least its tangible book value and on an acquisition standpoint could be worth 1.4-1.5x TBV. Overall, the bank would fit best in a portfolio of other small community banks. This entry was posted in Uncategorized on August 3, 2016 by Nick Bodnar.